Thanksgiving is just around the corner! As someone who is always thinking of her next meal, I couldn’t be more excited about the holiday. As most folks do, I have some favorite dishes that have always been traditional in my family. Homemade cranberry sauce. Cornbread dressing. Whole wheat bread dressing. I can’t wait to have these items on my plate. Over the years I’ve also updated some classics and they have bumped out the traditional dishes. The last couple of years I’ve been making a sweet potato puree with coconut milk, thanks to the recipe in Bryant Terry’s Vegan Soul Kitchen. A few years ago I updated green been casserole for a simple version of steamed green beans with pickled sweet and sour onions and a maple dressing. Love!! This year I plan to add Brussels sprouts to the table and came up with a new favorite way to eat them. 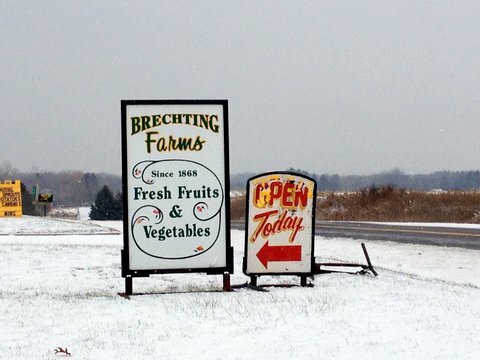 I picked up these beautiful Brussels sprouts at Brechting Farms on Six Mile road. They are my new favorite farm stand. The owner, Jill, is just a delight to talk with and I love knowing who grew my food. Sadly, I just discovered the market late this fall when a coworker recommended the Brussels sprouts. I’ve picked up potatoes, squashes, apples, onions, and these Brussels sprouts and all of the produce has been top notch. I’m looking forward to finding my way back there next spring–I’m sure that next year it will become a frequent stop on my way home from work! I recently taught a cooking class how to make these Brussels sprouts. Much to my surprise, everyone not only loved them, but were picking the plate for seconds! I cannot tell you how good that made me feel–and how much that solidified my plan to include this dish on the Thanksgiving table this year. 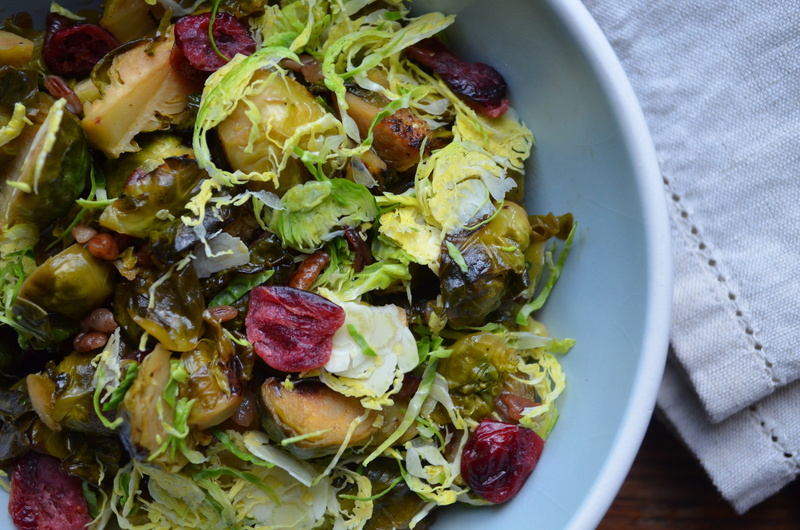 It’s a perfect seasonal dish and Brussels sprouts are one of those vegetables that taste even better after a nice frost. 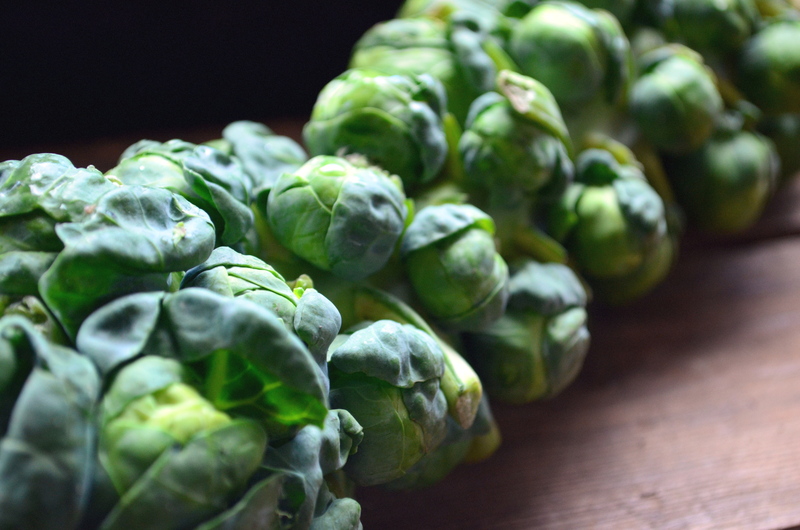 You can find Brussels sprouts at the grocery store or at farm stands if you are lucky. At farm stands they are typically still on the stalk. It’s a little more work on prep end but I find them to taste sweeter when they are fresh off the stalk and it’s somehow more satisfying to know how my food grows and what it looks like before it comes to the grocery store. 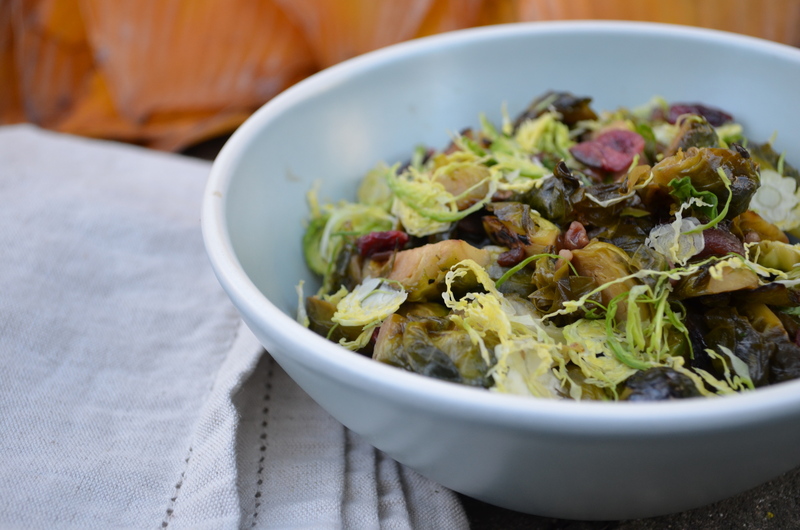 And if you have any Brussels sprouts naysayers, just ask them to pop one of these sweet little apple cider glazed cabbages in their mouth and they will be singing a new tune. Clean and prepare one pound of Brussels sprouts. Carefully cut each off the stalk. Remove any off-colored leaves, those with spotting, and any dirt. Wash and drain in a colander. Cut Brussels sprouts into halves if small or quartered if large. You may end up with some halved, some quartered, and some whole depending on the varying sizes of the sprouts, even if they come from the same stalk. Heat 1 tablespoon of oil in a wok or large skillet. Add Brussels sprouts and onion slivers to the skillet and cook for 2 minutes until some sides of the sprouts are browned. Add apple cider and cranberries and cook for about 5 minutes or until the cider has cooked down to a sticky glaze. Splash vinegar onto the sprouts and sprinkle with pecans. Remove from heat and place on serving dish. Shave raw Brussels sprouts onto the dish and sprinkle with additional pecans if desired. Lighten Up, America! It's Red Flannel Hash! And a Giveaway!